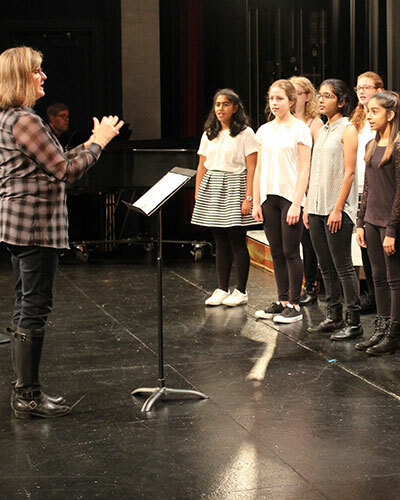 Our schedule is rich with opportunities to support our amazing Overlake artists – young performers who also play sports, volunteer in the community and earn high grades. Expressing one’s creativity through performance or visual arts media is a vital part of developing the whole person, and the ability to incorporate the arts into a rich academic and athletic life is one of the great opportunities that Overlake provides. Performing at Overlake offers students wonderful opportunities to connect with classmates and instructors as they work toward opening nights! Our Town is a beautifully crafted story of a small New Hampshire town, and specifically of two young people--Emily and George, in the early 1900s. It's a deceivingly simple story of a place and time where not much seems to happen, and yet the audience is directed to the vast universe of details that we miss every moment of our lives... unless we actively choose to notice. It's a powerful message for our complicated, fast-moving times. Our production will be performed in-the-round, with the audience moved up on stage, so the action is only a few feet away. It should be a very new experience for actors and regular Overlake theater goers as well! As a result we will only have about 120 available seats for each performance, so be sure to get your tickets early. The show is also double-cast with the same actors playing different roles on different nights... be sure to see BOTH versions! Admission: $10 Adults, $8 Students & Seniors. Tickets available at www.showtix4u.com or at the door. April showers bring…May Music to Overlake. Vocal, orchestral, jazz, symphonic and more – pick your concert, or three, or four! Watch the Overlake campus come alive with fantastic visual art exhibits, drama and music performances, food and creative surprises! Disney’s beloved film, The Lion King, comes to the stage in this inspiring coming-of-age tale featuring Simba, an unforgettable cast of characters, and soul-stirring music. Performers are expected to attend all rehearsals and performances. Rehearsal conflicts are to be submitted to the director of the production when requested. Production leaders are aware of the multiple athletic and artistic commitments of students and work to optimize scheduling for all arts program participants. Academic responsibilities, such as homework, are common to all Overlake students, artist and athletes and are therefore not a reason to miss a rehearsal or performance. If a student is absent from school due to an illness, his or her absence from after-school rehearsal is assumed. To ensure that students of all levels of experience and ability can experience the arts at Overlake, many performance and exhibit opportunities are based on classes with open enrollment (upon completion of prerequisites). Roles and responsibilities within productions are based on dedication and skill level. We believe that this structure enables beginning and advanced arts students to work together, support each other, and create and even stronger arts community. Overlake family support for young artists is wonderful. 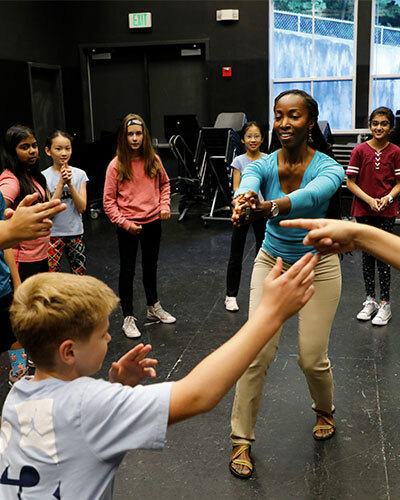 Whether case in the ensemble or a lead role, faculty works to ensure that student has opportunity to build artistic skills and enjoy creative growth. Please remember that the best way to optimize your child’s arts experience is to support the directorial, casting and scheduling choices of the production team and encourage your young performer to self-educate and self-advocate within the creative community they have joined.